A Phone Sales Representative typically doesn’t travel home to home to sell the product, but these professionals use the telephone to reach the customers. As part of the job description, the Phone Sales Representative performs various tasks that include – conducting cold calls, recording customers response, receiving and placing orders, recommending add-ons or other services to the existing customers over phone, participating in PR and marketing campaigns, identifying needs of the customer, locating new customers, making frequent calls to convert potential customers as clients and updating client database. Since these representatives communicate only through phone, they are expected to have good communication skills, telephone etiquette, and clarity in speech. The person should also be able to speak fluently in various languages and be clear in delivering the right message. 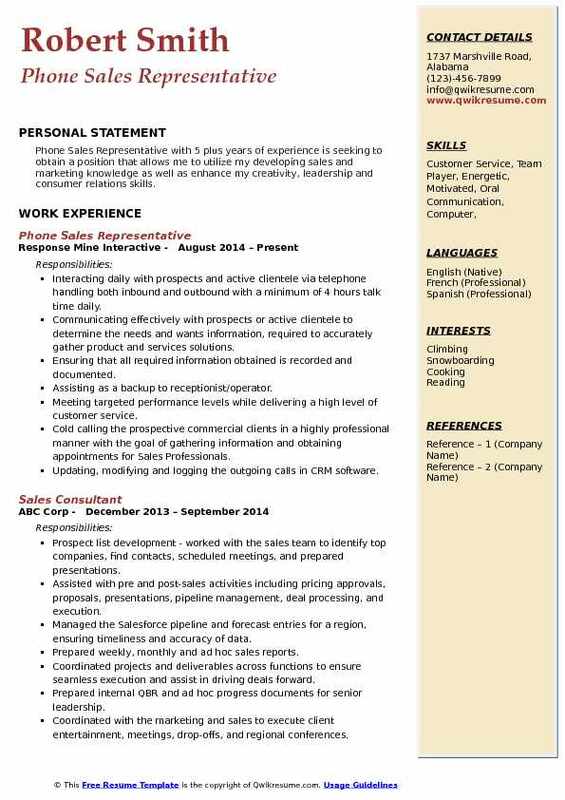 At a minimum, candidates are expected to depict in the Phone Sales Representative Resume a high school diploma or a GED. Summary : Senior Phone Sales Representative with 6 plus years of experience in the Technology domain is seeking a position to work and deliver excellent customer service while making a positive contribution to the business. Managing the new leads from outbound and inbound calls also through e-mail. Building the immediate rapport with clients through friendly and engaging attitude. Recommending changes in products, service, and policy by evaluating results and competitive developments. Monitoring competition by gathering current marketplace information on pricing and products being sold. Answering calls from customers inquiring about products and services offered by clients. Ongoing maintenance of high levels of productivity to meet and exceed sales goals. Dedicated to providing customers with excellent service while making their business my top priority. Ensuring the privacy of detailed client information not limited to socials federal tax id’s. Trained on all functions of products available, including diagnosing verifying customers issues needing to be fixed. 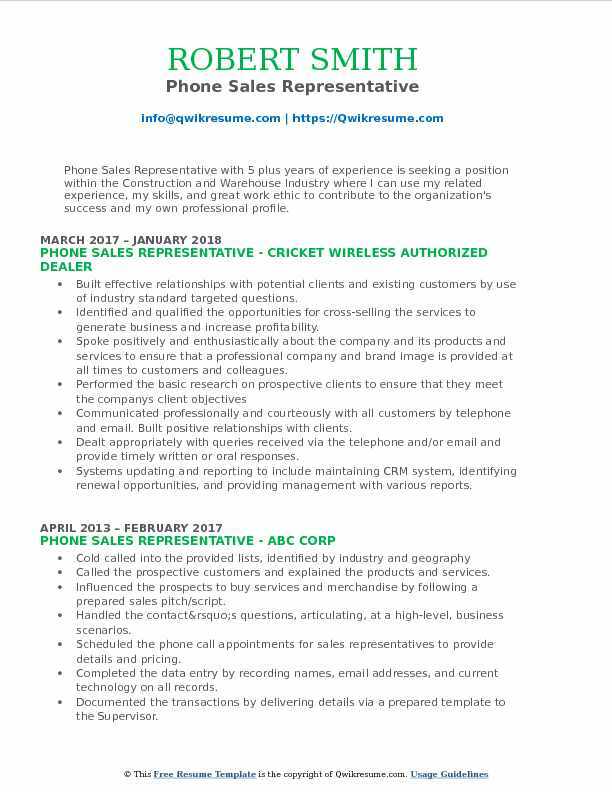 Summary : Phone Sales Representative II with 16 years of experience as a freelancer is seeking to establish a long-term position utilizing my personal drive and ambition to succeed in a long-term career. Gathering and verifying all required customer information for tracking purposes. Writing advertising copy for several grassroots marketing campaigns on social media. Addressing and resolving the customer concerns empathetically and professionally. Accurately documenting, researching and resolving the customer service issues. Frequently using the word processing, spreadsheet, database, and presentation software. Formatting text and graphics for blog posts, newsletters, and other materials. Creating the qualified accounts from inbound/outbound calls, emails interaction. Assessing customers needs with confidence as well as being able to build a genuine relationship with each customer I come in contact with. Providing excellent customer service to guest with a positive attitude, demeanor, and tone. 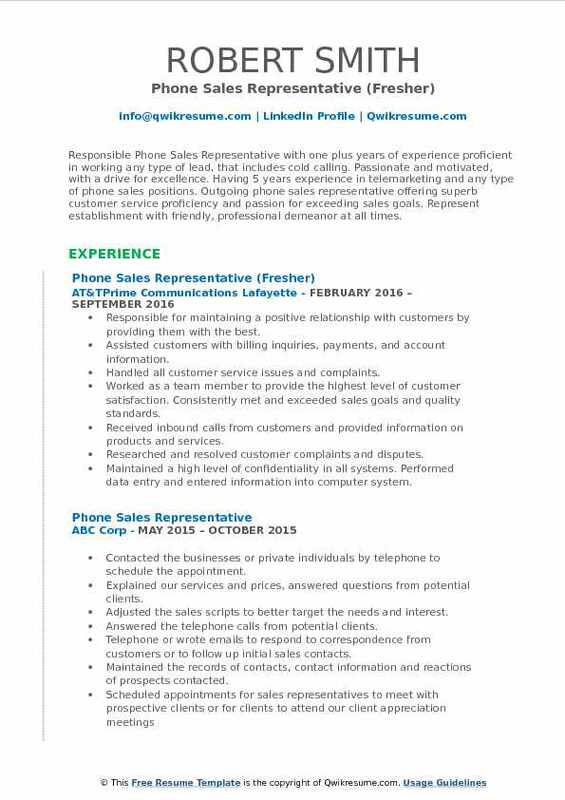 Summary : Phone Sales Representative I with 14 years of experience in the Retail domain. 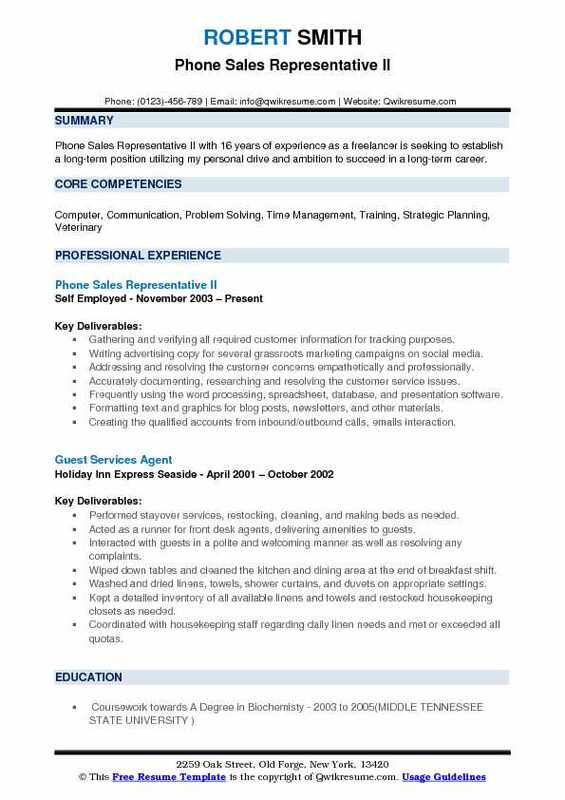 Ambitious professional is driven to launch a career in business, specifically sales. Brings valuable experience from many years of customer service type work and working with business professionals. Spoke with new and returning customers on the phone, helping them with their orders, selling and upgrading products. Answered the telephone calls from potential customers who have been solicited through advertisements. Explained the products or services and prices, and answered the questions from customers. Adjusted the sales scripts to better target the needs and interests of specific individuals. Cold sales using a pre-generated list of contacts calls potential customers in an effort to supply them with consignment seed racks throughout the united states. Key responsibilities include answering incoming calls and bidding on merchandise for pre-registered customers. Registered new customers and handle customer service issues such as tracking packages and up selling merchandise. 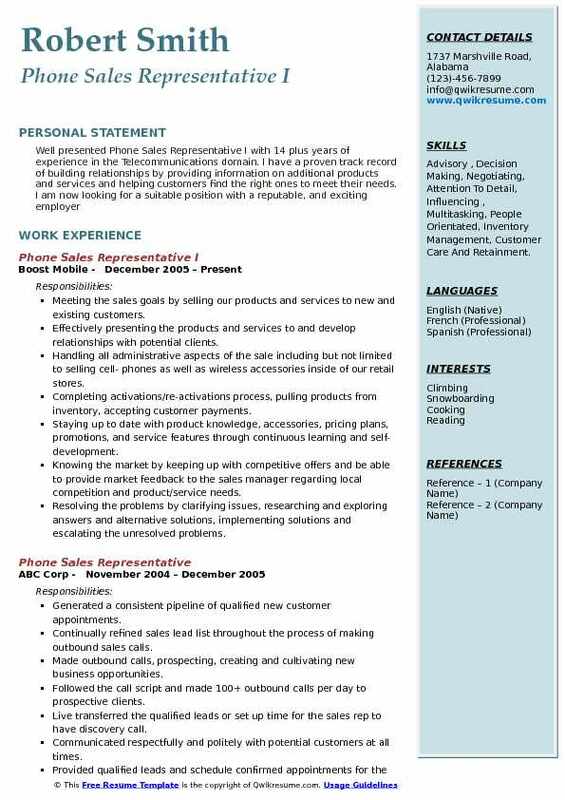 Objective : Responsible Phone Sales Representative with one plus years of experience proficient in working any type of lead, that includes cold calling. Passionate and motivated, with a drive for excellence. 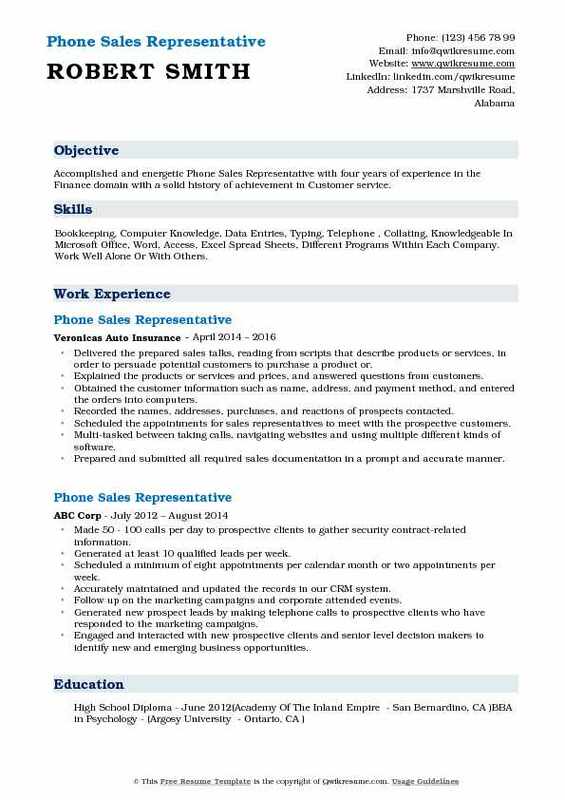 Having 5 years experience in telemarketing and any type of phone sales positions. Outgoing phone sales representative offering superb customer service proficiency and passion for exceeding sales goals. Represent establishment with friendly, professional demeanor at all times. Responsible for maintaining a positive relationship with customers by providing them with the best. Assisted customers with billing inquiries, payments, and account information. Handled all customer service issues and complaints. Worked as a team member to provide the highest level of customer satisfaction. Consistently met and exceeded sales goals and quality standards. Received inbound calls from customers and provided information on products and services. Researched and resolved customer complaints and disputes. Maintained a high level of confidentiality in all systems. Performed data entry and entered information into computer system. Called potential clients. Offered our business. Referred them over to our closer. Answered phones to clients. Gave info about our services. Signed them up and referred them over to our closers. Skills : Advisory , Decision Making, Negotiating, Attention To Detail, Influencing , Multitasking, People Orientated, Inventory Management, Customer Care And Retainment. Meeting the sales goals by selling our products and services to new and existing customers. Effectively presenting the products and services to and develop relationships with potential clients. Handling all administrative aspects of the sale including but not limited to selling cell- phones as well as wireless accessories inside of our retail stores. Completing activations/re-activations process, pulling products from inventory, accepting customer payments. Staying up to date with product knowledge, accessories, pricing plans, promotions, and service features through continuous learning and self-development. Knowing the market by keeping up with competitive offers and be able to provide market feedback to the sales manager regarding local competition and product/service needs. Resolving the problems by clarifying issues, researching and exploring answers and alternative solutions, implementing solutions and escalating the unresolved problems. 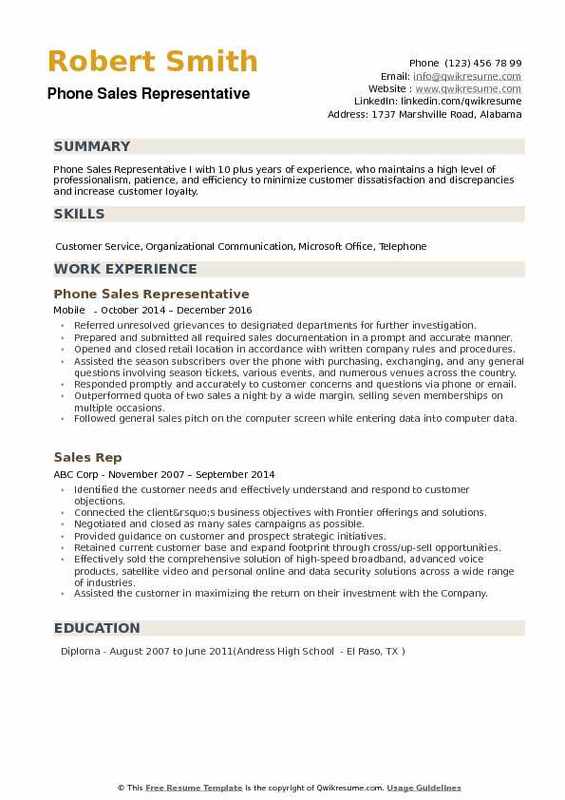 Objective : Accomplished and energetic Phone Sales Representative with four years of experience in the Finance domain with a solid history of achievement in Customer service. 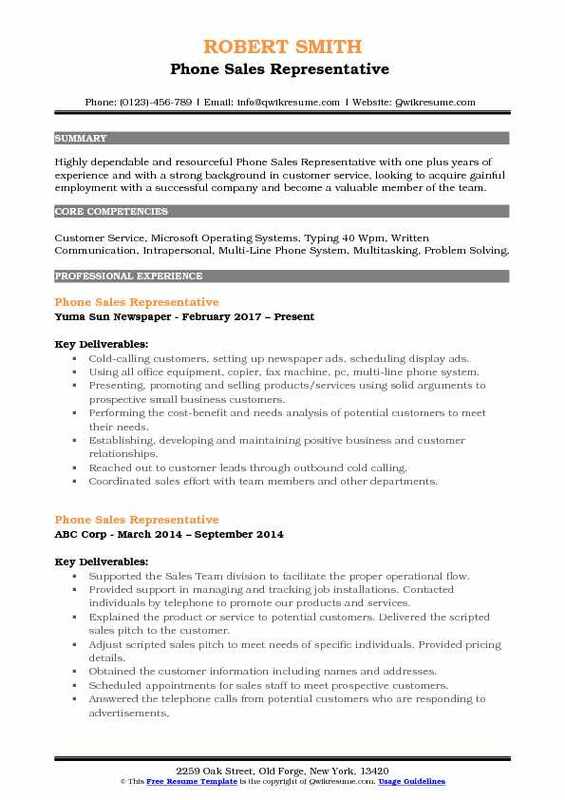 Skills : Bookkeeping, Computer Knowledge, Data Entries, Typing, Telephone , Collating, Knowledgeable In Microsoft Office, Word, Access, Excel Spread Sheets, Different Programs Within Each Company. Work Well Alone Or With Others. Delivered the prepared sales talks, reading from scripts that describe products or services, in order to persuade potential customers to purchase a product or. Explained the products or services and prices, and answered questions from customers. Obtained the customer information such as name, address, and payment method, and entered the orders into computers. Recorded the names, addresses, purchases, and reactions of prospects contacted. Scheduled the appointments for sales representatives to meet with the prospective customers. Multi-tasked between taking calls, navigating websites and using multiple different kinds of software. Prepared and submitted all required sales documentation in a prompt and accurate manner. Managed new leads from outbound and inbound calls e-mail and walk-in customer traffic. Followed-up on quotes. Forwarded daily e-mails to owner and sales manager. Headline : Phone Sales Representative with 5 plus years of experience is seeking a position within the Construction and Warehouse Industry where I can use my related experience, my skills, and great work ethic to contribute to the organization's success and my own professional profile. Built effective relationships with potential clients and existing customers by use of industry standard targeted questions. Identified and qualified the opportunities for cross-selling the services to generate business and increase profitability. Spoke positively and enthusiastically about the company and its products and services to ensure that a professional company and brand image is provided at all times to customers and colleagues. Communicated professionally and courteously with all customers by telephone and email. Built positive relationships with clients. Dealt appropriately with queries received via the telephone and/or email and provide timely written or oral responses. Systems updating and reporting to include maintaining CRM system, identifying renewal opportunities, and providing management with various reports. 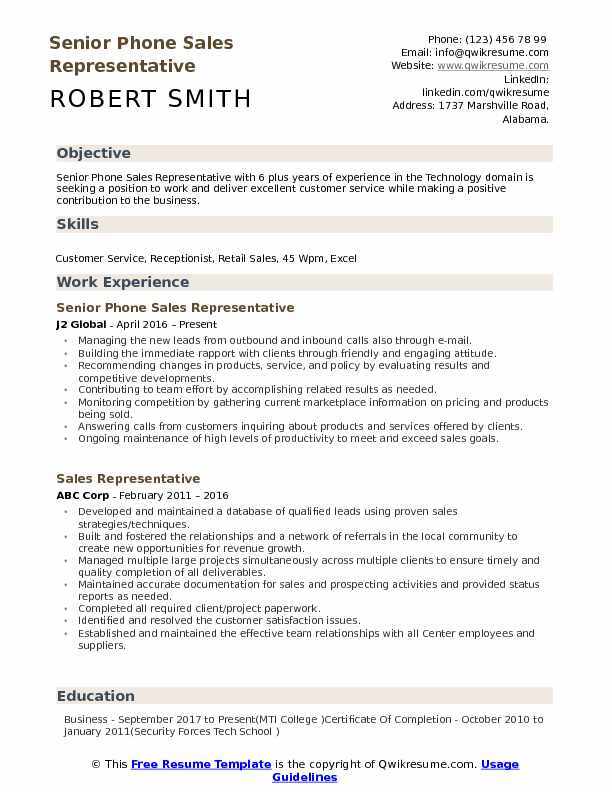 Objective : Highly dependable and resourceful Phone Sales Representative with one plus years of experience and with a strong background in customer service, looking to acquire gainful employment with a successful company and become a valuable member of the team. Cold-calling customers, setting up newspaper ads, scheduling display ads. Using all office equipment, copier, fax machine, pc, multi-line phone system. Presenting, promoting and selling products/services using solid arguments to prospective small business customers. Performing the cost-benefit and needs analysis of potential customers to meet their needs. Reached out to customer leads through outbound cold calling. Coordinated sales effort with team members and other departments. Keeping abreast of best practices and promotional trends. Attracting the potential new customers by answering all inbound calls or initiating calls to potential customers who are responding to advertisements and through other marketing channels. Explaining the products and services in a professional and enthusiastic manner. 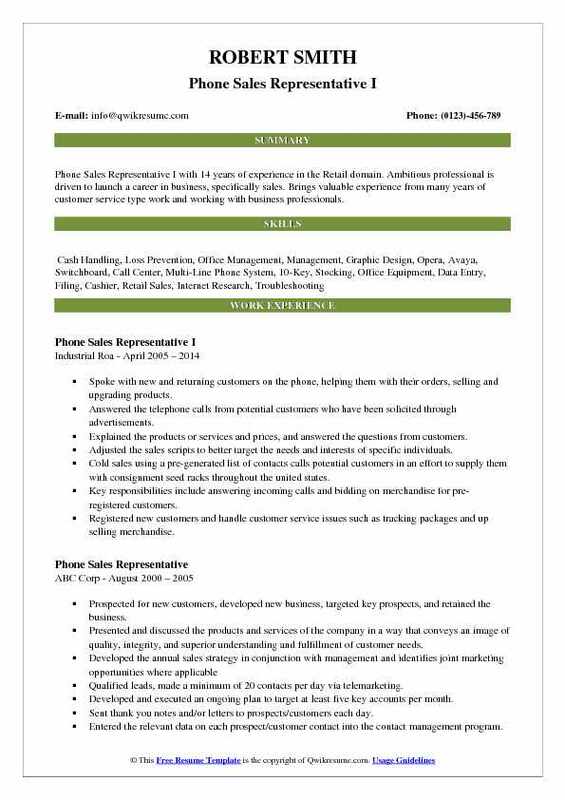 Headline : Phone Sales Representative with 5 plus years of experience is seeking to obtain a position that allows me to utilize my developing sales and marketing knowledge as well as enhance my creativity, leadership and consumer relations skills. Interacting daily with prospects and active clientele via telephone handling both inbound and outbound with a minimum of 4 hours talk time daily. Communicating effectively with prospects or active clientele to determine the needs and wants information, required to accurately gather product and services solutions. Ensuring that all required information obtained is recorded and documented. Assisting as a backup to receptionist/operator. Meeting targeted performance levels while delivering a high level of customer service. Cold calling the prospective commercial clients in a highly professional manner with the goal of gathering information and obtaining appointments for Sales Professionals. Updating, modifying and logging the outgoing calls in CRM software. Follow-up with prospective clients on prior calls or requests. Cold calling and performing other lead generation activities. Persuading the potential customers to purchase a product or service. Summary : Phone Sales Representative I with 10 plus years of experience, who maintains a high level of professionalism, patience, and efficiency to minimize customer dissatisfaction and discrepancies and increase customer loyalty. Referred unresolved grievances to designated departments for further investigation. Opened and closed retail location in accordance with written company rules and procedures. Assisted the season subscribers over the phone with purchasing, exchanging, and any general questions involving season tickets, various events, and numerous venues across the country. Responded promptly and accurately to customer concerns and questions via phone or email. Outperformed quota of two sales a night by a wide margin, selling seven memberships on multiple occasions. Followed general sales pitch on the computer screen while entering data into computer data.